The first operation you will see will be the “site preparation.” Where necessary, we will carefully move any plants from the work area, unless you have already taken care of this before we arrive. All work is supervised by an experienced AAA Foreman. We will break through concrete, or any other paved surface where necessary and hand dig access holes that are three to four feet deep. These holes are about the size of a common door mat. Unless your repair system requires interior pilings, no access to the inside of your home will be required at this time. The next operation begins with the “driving” of the pilings. It will be necessary for us to have access to electrical outlets during this operation. The first concrete cylinder is driven into the ground with hydraulic pumps at each predetermined location. 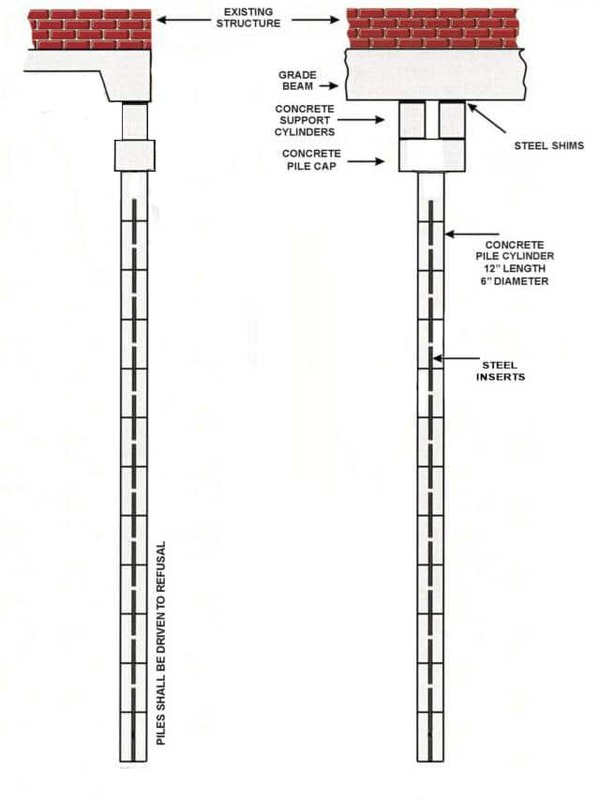 Subsequent concrete piling segments (with steel connectors through the center of each concrete cylinder) are driven to the required depth and resistance, sometimes up to twenty feet or more. A concrete piling cap is positioned on top of the last pile segment of all pilings. Concrete support cylinders are then placed between the piling cap and the bottom of the foundation beam. The next step is the “raising” of the foundation. We raise the low parts of the foundation (in the areas where the pilings are installed) to as near their original elevations as possible. Jacks are placed on top of the pilings. An experienced AAA Foreman directs the raising while carefully monitoring the reactions of the structure. When the raising is complete, steel shims are inserted between the support cylinders and foundation beam to secure the system. After securing the foundation, the final step is the cleanup. Each hole is refilled with soil, and any concrete breakthroughs are patched. Plants are replanted and the yard, walks and drives are cleaned, raked, swept and washed. The entire process, from start to finish, usually takes 1 or 2 days, depending on the predetermined number of pilings your home requires.